Stylish 4 bed /3 bath ranch home in the heart of desirable Reunion, near Reunion Park and Rec Center! Open contemporary layout concept featuring entry hall, 9+ ft cathedral ceilings and sleek engineered wood plank flooring. Beautiful Gourmet Kitchen featuring eat-in center island, all SS appliances, granite slab and walk-in pantry. The luminous main level is surrounded by large windows including bay windows in Master Room and elegant Study. Master Retreat with walk-in closet and 4-piece en-suite bathroom. Entertainers exteriors with covered porch, hot tub, sunbathing patio and xeriscape landscaping for easy maintenance and low water usage. Finished basement where everyone will enjoy hours of fun. Incredibly spacious Rec/Family Room with multiple gathering areas, recessed lighting and bonus storage space. Completed by private Guest Bedroom with walk-in closet and tiled Bath. Close to schools, markets and eateries. 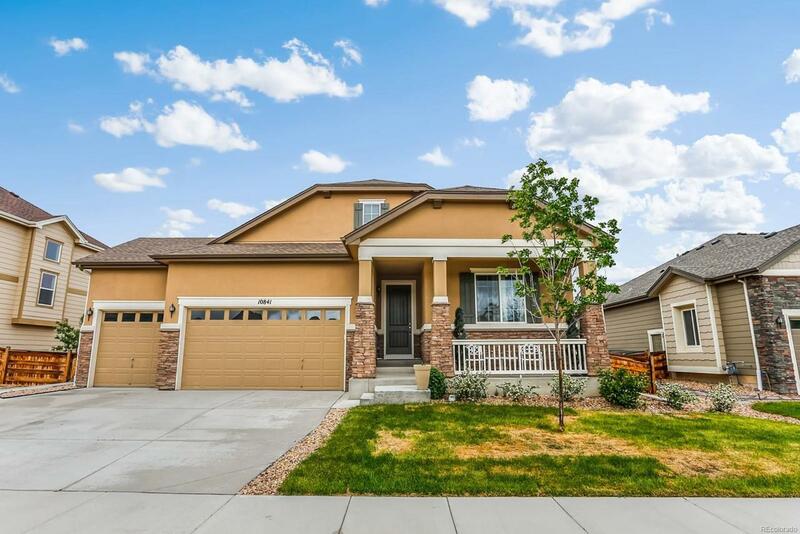 Quick access to E-470, Buffalo Run Golf Course and 104th Ave!